DAVID A.BOSSERT received a B.F.A. in Character Animation from Cal Arts School of Film.Mr. Bossert has been with The Walt Disney Company for more than thirty years.He has served as a producer, director, associate producer, artistic coordinator, visual effects supervisor, and effects animator on various films and is currently serving as the producer, creative director and head of Special Projects at Walt Disney Animation Studios. His film work includes The Little Mermaid, Beauty and the Beast, Aladdin, The Lion King, Pocahontas, Who Framed Roger Rabbit, Tim Burton's The Nightmare Before Christmas, Hercules, Fantasia/2000,and the Academy Award-nominated shorts Runaway Brain, Destino, and Lorenzo. Dave produced and directed the award-winning documentary on music in animation titled The Tunes Behind the Toons. He most recently wrote the biography Remembering Roy E. Disney: Memories and Photos of a Storied Life for Disney Editions, and is the co-author of Disney Animated, which was named iPad App of 2013 by Apple. ERIC GOLDBERG, supervising animator and director at the Walt Disney Animation Studios, has brought to life Aladdin's Genie, Hercules's Phil, The Princess and the Frog's Louis, and many more. Mr. Goldberg co-directed the Academy Award winning Pocahontas and directed two segments, "Rhapsody in Blue" and "The Carnival of the Animals, Finale," in Fantasia/2000. Most recently he led the hand-drawn animation team on the satirical short Get a Horse!,starring Mickey and friends, which debuted in theaters with Frozen. Before joining The Walt Disney Company in 1990, he founded and ran his own award-winning animation house, Pizazz Pictures, in London. 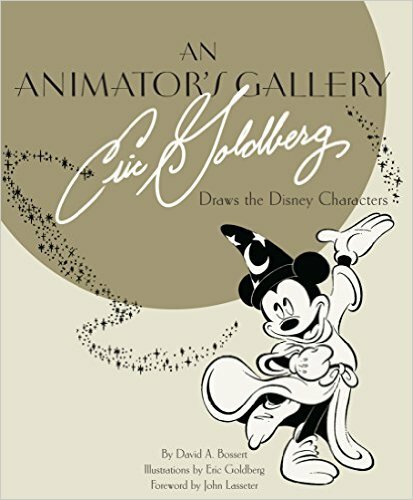 An Animator's Gallery: Eric Goldberg Draws the Disney Characters by David A. Bossert is an incredible look into the playful drawings of many Disney Characters! This is a beautiful tribute to Eric Goldberg and is a perfect book for any collector. My family and I love flipping through this book and enjoy looking at all the different black and white drawings of the Disney characters. Thoughout this book are many beloved characters such as Mickey Mouse, Frozen characters, Snow White, Aladdin and many more. Amazingly Beautiful book for displaying! You can find An Animator's Gallery by David A. Bossert on Amazon, Barnes and Noble and other bookstores.